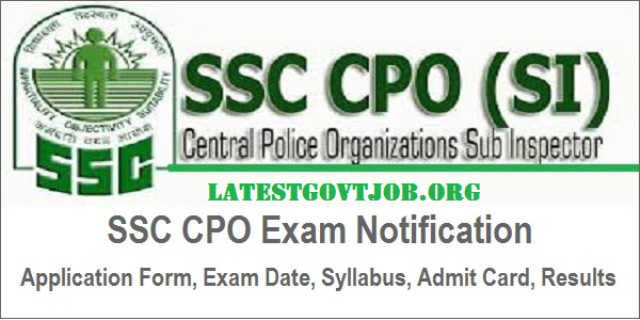 SSC CPO Recruitment 2018 for SI & ASI 1223 Vacancies @ssconline.nic.in : Staff Selection Commission (SSC), Central Police Organization has released a notification for the recruitment of 1223 Sub-Inspectors in Central Armed Police Forces (CAPFs) and Assistant Sub-Inspectors in Central Industrial Security Force (CISF). Interested candidates may check the vacancy details and apply online from 03-03-2018 to 02-04-2018. Selection of candidates will be made on the basis of Computer Based Examination and Descriptive Test. All candidates have to pay Rs. 100 through SBI Bank Challan OR online mode using Net-banking/Credit or Debit Card. Women candidates (SC/ST/Ex-Servicemen) don't have to pay any fee. Interested and eligible candidates may apply online through SSC website - http://ssconline.nic.in - from 03-03-2018 to 02-04-2018.